The RDC, Rapid Deployment Craft, is the safest, most durable, easiest to use, rescue boat ever made. It works in so many applications, that it is the only non-motorized boat a department may need. The RDC is a radical departure from the practice of drafting recreational craft into rescue service. This boat was designed and built to take the stresses incurred by those who need to work in demanding, water related rescue situations. If you have never seen anything like it, you are not alone. It was one of those, "Why didn't I think of that"!, type of stories. The RDC has extremely rockered (upturned) ends. They allow the rescuer to "drive" the boat's open end over the victim while the victim's head remains above water at all times. 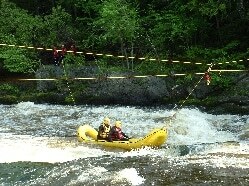 It also allows a rescuer to reach forward into a pour-over while still safely centered in the boat. The floor is open at each end, allowing 2 entry points. 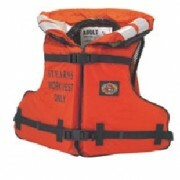 The freeboard height is only inches, enabling a rescuer to easily pull a victim into the boat. This also allows a diver, with tanks on, to pull themselves into the craft with minimal effort. The two entry portals on either end also act as carrying points which provide a perimeter of safety in case of sudden ice failure or mud sinking. These carrying points are comfortably at your sides. Carrying the RDC is like using a litter with long handles, which, by the way, is one of its many uses. 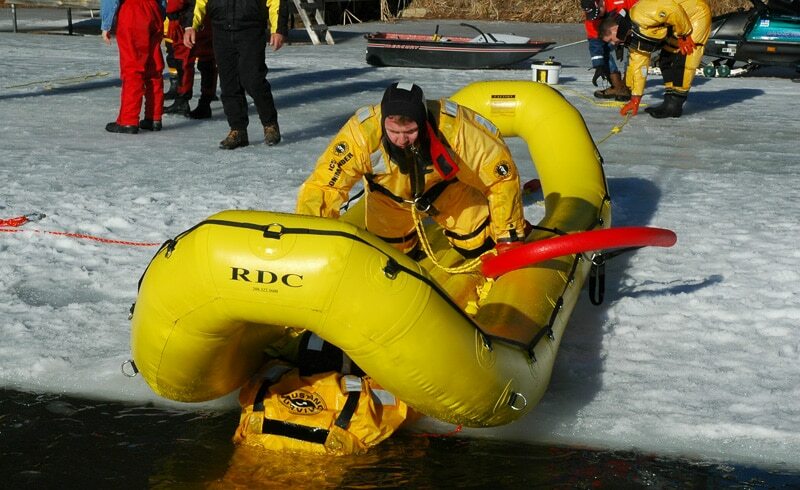 The RDC will store in a 2' cube, inflate in a heartbeat, and can easily be carried by one person. 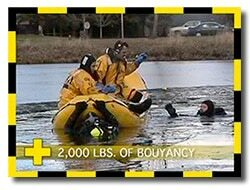 The most common way to carry it is deflated and stored in a rescue boat or vehicle. Think about how often you arrive at a scene and cannot find a place to launch your motorized boat. This is why you should have the RDC along on every call.